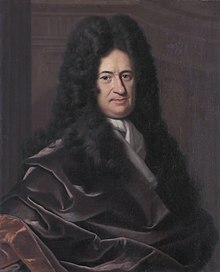 Gottfried Wilhelm (von) Leibniz (sometimes spelled Leibnitz) (/ˈlaɪbnɪts/; German: [ˈɡɔtfʁiːt ˈvɪlhɛlm fɔn ˈlaɪbnɪts] or [ˈlaɪpnɪts]; French: Godefroi Guillaume Leibnitz; 1 July 1646 [O.S. 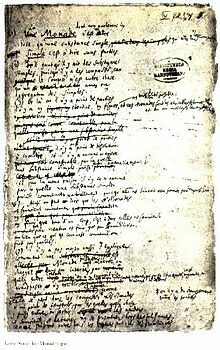 21 June] – 14 November 1716) was a prominent German (of Slavic origin) polymath and philosopher in the history of mathematics and the history of philosophy. His most notable accomplishment was conceiving the ideas of differential and integral calculus, independently of Isaac Newton's contemporaneous developments. 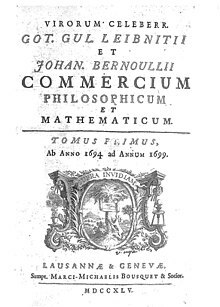 Mathematical works have generally favored Leibniz's notation as the conventional expression of calculus. It was only in the 20th century that Leibniz's law of continuity and transcendental law of homogeneity found mathematical implementation (by means of non-standard analysis). He became one of the most prolific inventors in the field of mechanical calculators. 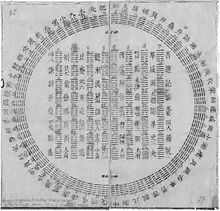 While working on adding automatic multiplication and division to Pascal's calculator, he was the first to describe a pinwheel calculator in 1685 and invented the Leibniz wheel, used in the arithmometer, the first mass-produced mechanical calculator. He also refined the binary number system, which is the foundation of all digital computers. ^ McNab, John (1972). Towards a Theology of Social Concern: A Comparative Study of the Elements for Social Concern in the Writings of Frederick D. Maurice and Walter Rauschenbusch (PhD thesis). Montreal: McGill University. p. 201. Retrieved 6 February 2019. ^ "Leibniz biography". www-history.mcs.st-andrews.ac.uk. Retrieved 8 May 2018. ^ "Christian Mathematicians – Leibniz – God & Math – Thinking Christianly About Math Education". 31 January 2012. ^ Gottfried Wilhelm Leibniz (2012). Peter Loptson (ed.). Discourse on Metaphysics and Other Writings. Broadview Press. pp. 23–24. ISBN 978-1-55481-011-6. The answer is unknowable, but it may not be unreasonable to see him, at least in theological terms, as essentially a deist. He is a determinist: there are no miracles (the events so called being merely instances of infrequently occurring natural laws); Christ has no real role in the system; we live forever, and hence we carry on after our deaths, but then everything—every individual substance—carries on forever. Nonetheless, Leibniz is a theist. His system is generated from, and needs, the postulate of a creative god. In fact, though, despite Leibniz's protestations, his God is more the architect and engineer of the vast complex world-system than the embodiment of love of Christian orthodoxy. ^ O'Leary-Hawthorne, John; Cover, J.A. (4 September 2008). Substance and Individuation in Leibniz. Cambridge University Press. p. 65. ISBN 978-0-521-07303-5. ^ a b Perkins, Franklin (10 July 2007). Leibniz: A Guide for the Perplexed. Bloomsbury Academic. p. 22. ISBN 978-0-8264-8921-0. ^ Perkins, Franklin (10 July 2007). Leibniz: A Guide for the Perplexed. Bloomsbury Academic. p. 23. ISBN 978-0-8264-8921-0. ^ Geier, Manfred (17 February 2017). Wittgenstein und Heidegger: Die letzten Philosophen (in German). Rowohlt Verlag. ISBN 978-3-644-04511-8. Retrieved 26 April 2017. ^ Jones, Matthew L. (1 October 2006). The Good Life in the Scientific Revolution: Descartes, Pascal, Leibniz, and the Cultivation of Virtue. University of Chicago Press. pp. 237–239. ISBN 978-0-226-40955-9. ^ Davis, Martin (28 February 2018). The Universal Computer : The Road from Leibniz to Turing, Third Edition. CRC Press. p. 7. ISBN 978-1-138-50208-6. ^ "Gottfried Wilhelm Leibniz | Biography & Facts". Encyclopedia Britannica. Retrieved 18 February 2019. Look, Brandon C. "Gottfried Wilhelm Leibniz". In Zalta, Edward N. (ed.). Stanford Encyclopedia of Philosophy. Peckhaus, Volker. "Leibniz's Influence on 19th Century Logic". In Zalta, Edward N. (ed.). Stanford Encyclopedia of Philosophy.